NoIR Medical Technologies produces fashionable, functional and affordable glasses that filter out unwanted light and glare. The NoIR filter system protects against ultraviolet, visible and infrared light. 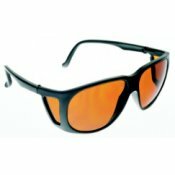 The light that reaches the eye then maximizes the functional vision, enhances contrast and reduces uncomfortable glare. Relief from light sensitivity, glare and discomfort from the onset of Macular Degeneration and other vision impairments helps increase mobility. NoIR filters absorb ultraviolet light (to 400nm) and some heat to protect the retina against long term exposure to high energy wavelengths that contribute to degeneration. Now you are able to have a comfortable viewing experience.